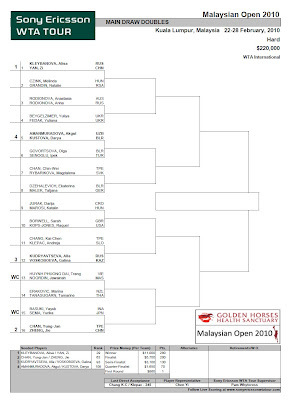 The main draw for the Sony Ericsson WTA Tour Malaysian Open 2010 was held on Saturday afternoon and was attended by Elena Dementieva and Ekaterina Ivanova. Both Zheng Jie and Li Na are placed in the opposite sides of the draw; setting up a potential all-Chinese final between the two. 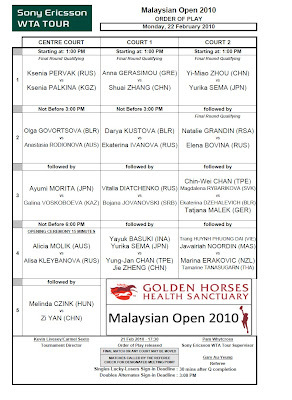 Check out the complete Main Draw Singles and OOP below. 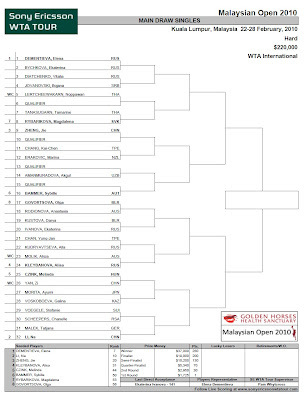 And here's the Doubles Main Draw. Too bad many players did not turn up at this tournament, which includes crowd-puller at the recent Asia/Oceania Fed Cup Kimiko Date-Krumm, Sania Mirza, Sabine Lisicki and Jelena Dokic.